I just do not have the TIME OR INCLINATION TO APPRAISE a bunch of steins (I get about 10 to 20 requests every week !!! There are way too many variables ► their condition, location, the time of year, present trends in stein /drinking vessel collecting, local (and now national) economics; but by far the “biggest problem of all in communicating “so called values” are the prior expectations by the owner[s] ! (which are most usually based on hearsay and old, old rumors provide by other family members!! This web site was started as an informational site for beginning beer stein collectors that would be looking for the info and not the general public. but this site does have its own search engine [top right on each page!] SO if one puts in “Wood Steins” or “Hand painted steins,” it will give one a list of all the pages that has that should have that subject matter word within it. NOTE: I am sorry… but this feature is case sensitive (A “Word Press: feature, and not MINE !!! “Saint George”  – Saint George was a Roman soldier and priest in the Guard of Diocletian, and who is venerated as a Christian martyr. 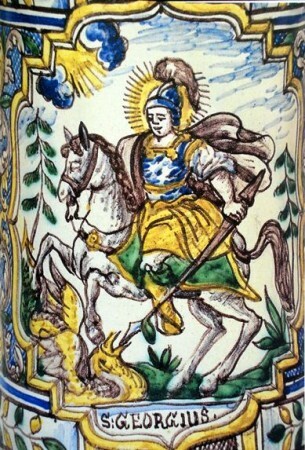 In hagiography Saint George is one of the most pictured saints in the Catholic, Anglican, Orthodox churches. 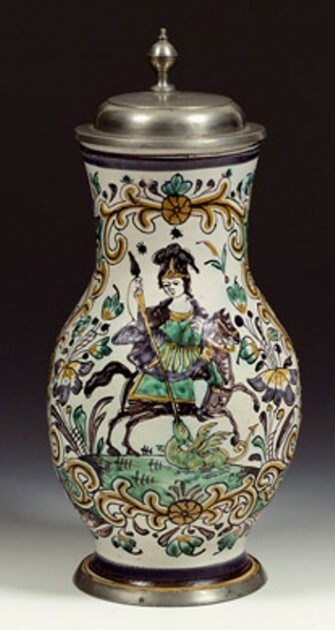 He is immortalized in the tale of Saint George and the Dragon. The episode of St. George and the Dragon was a legend brought back with the Crusaders and retold with the courtly appurtenances belonging to the genre of Romance. By far the most revered Saint in the Christian world. He is the patron Saint of both England and Russia. Almost every stein maker made at least one stein to honor him (and to sell) including V & B Mettlach. 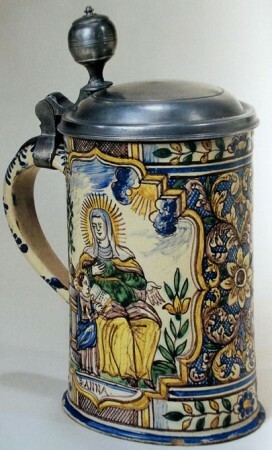 BELOW ARE SOME OF THE MANY MODERN BEER STEINS MADE BY “ORIGINAL KING”, GERMANY DEDICATED TO ST. GEORGE.